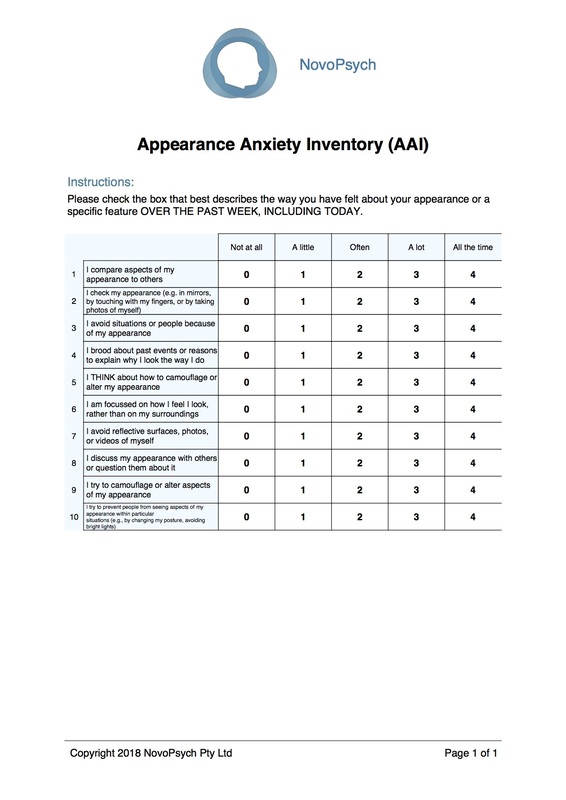 The Appearance Anxiety Inventory is a 10 question self-report scale that measures the cognitive and behavioral aspects of body image anxiety in general, and body dysmorphic disorder (BDD) in particular. This scale is useful as part of a diagnostic procedure for BDD as well as symptom monitoring during treatment. The AAI was developed by Veale et al (2014). They examined the psychometric properties in a clinical BDD sample and non-clinical community sample in the UK. The AAI was found to have good convergent validity, with correlations of .55 with the clinician rated YBOCS-BDD and .58 with the PHQ9. Internal consistency was high, with a Cronbachs Alpha of .86. Two subscales were found using factor analysis; Avoidance and Threat Monitoring. The BDD validation sample (n = 139) had a median age of 28 and was 51.8% female. A subgroup of 12 participants had a median AAI score of 26 at diagnosis and 10.50 after CBT treatment. The non-clinical community sample (n = 108) was used to establish the normal levels of appearance anxiety among relatively healthy individuals. The group had a median age of 28.5 and 75.9% were female. The mean score was 15.45 (SD = 8.68). Scores consistent of a total raw score derived by summing each item as well as two subscales. 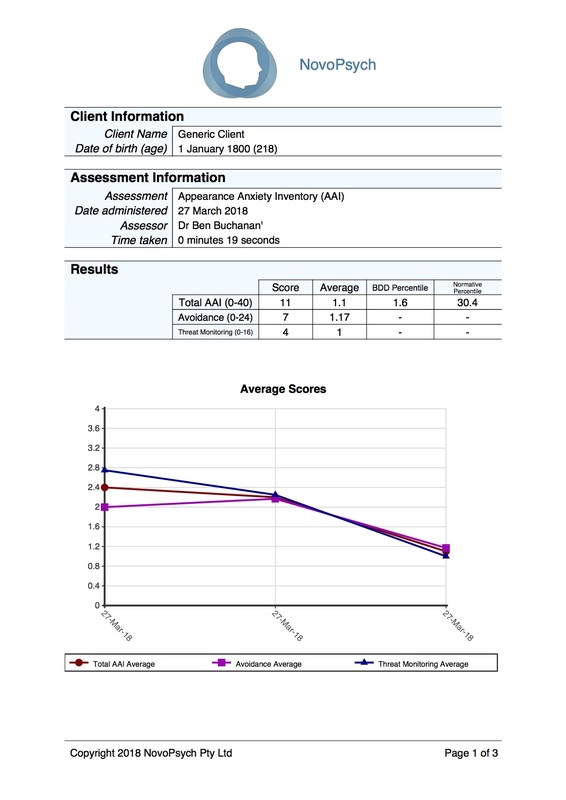 Two percentiles are presented to indicate how AAI scores compare to a body dysmorphic disorder group and a community sample. A BDD percentile of 50 indicates average symptoms for someone with a BDD diagnosis before treatment, while the community percentile represents scores in comparison to a normal population. Veale et al. (2014) did not define a cut-off score for BDD diagnosis but Mastro et al. (2016) suggested a cutoff score of 20 as being indicative of high risk of clinical problems. Veale, D., Eshkevaria, E., Kanakama, N., Ellisona, N., Costa, A., and Werner, T. (2014). The Appearance Anxiety Inventory: Validation of a Process Measure in the Treatment of Body Dysmorphic Disorder. Behavioural and Cognitive Psychotherapy, 42, 605-616.